Who was "Dan the Feathers" or "The Last King"
Here once lived a man called Donal óg MacCarthy not only known for his fondness for Women and Drink but for his collection of Feathers from the Plum Helmets of the Queens forces. He was known in England as the "Robin Hood of Munster" but locally he was known as "Dan the Feathers" or "Dan of the Feathers". "The Last King" to the McCarthy Clan, Donal óg died quietly and now rests in Muckross Abbey a 30-minute walk through the National park from the Lake Hotel. History of the Castle from the windows of The Lake Hotel is the ruins of a Medieval Castle built on a rocky promontory within the grounds. It is situated on the eastern shore of Lough Lein or the Lower Lake and gives its name to that portion known as the Bay of Castlelough. In early times this district was known as Eóghanacht Lough Lein. The families who ruled here were descended from Eóghan Mór (Eoghan, Eoin or Owen) son of Aillil Olumm. Other branches of the same race ruled various parts of Cork, Limerick, and Tipperary. Their decedent’s of today are known by the family names of McCarthy, O’Sullivan, O’Mahony, O’Keeffe, O’Donovan, and O’Donoghue. The Anglo-Norman Invasion During the year 1152 Turlough O’Connor acting as High King, divided Munster between Dónal O’Brien and Diarmuid McCarthy, both to defer to him. 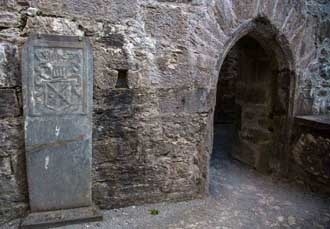 Diarmuid was King of Desmond, or South Munster, which extended from Lismore, Co. Waterford to Mount Brandon, Co. Kerry. On arrival of Henry 11 of England at Waterford in 1172, both these Kings swore allegiance to the King from overseas. They repented of this act and endeavored to make atonement. In the wake of Henry 11 were many land-hungry nobles who were given parchment grants of the land, but it was many years before the invaders occupied South Kerry. In 1214 a war broke out between two McCarthy kinsmen and Kerry became studded with Anglo-Norman Castles. The Carews erected that of Ardrully near Kilgarvan, the Fitzgeralds, those of Dunloe and Killorglin, Fitzmaurice at Molahiffe, and the Roches erected a Castle at Oirbealach. As the Tuath of Oirbealach extended along the shores of the Lein, it may be that the Castle on the Lake was first set up by the Roches. 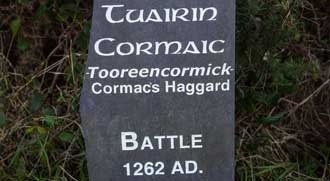 In 1261 and 1262, the McCarthy led an army into Kerry from West Cork and killed Gerald Roche. Cormac McCarthy was himself slain and a cairn on Mangerton marks the spot where he fell. But henceforth the McCarthys ruled South Kerry from their three Castles, that of Castlelough (on the Lake), Pallas and Ballycarbery near Cahirciveen. The Chief of the McCarthy was known as McCarthy Mór. He was entitled to rents and services from O’Sullivan Bere, O’Donoghue Mór, and O’Sullivan Mor and O’Donoghue from Glenflesk and many lesser McCarthy in Cork and Kerry. The annals of Innisfallen record the death of Dónal Óg McCarthy, King of the Irish of Desmond in 1390 at this Castle of Lough Lein and also that of his son Tadgh in 1428 at his Castle of Ballycarbery. They say of the latter that of all the wine drinkers of his time, he was the greatest. 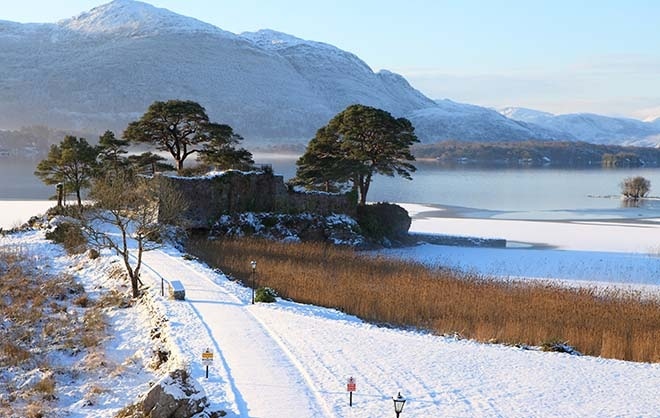 The Annals of the four masters relate that in 1517 the sons of another McCarthy chief known as Cormac Lyrah were expelled from the Castle on the Lake. In 1565, Queen Elizabeth created Donal McCarthy Mór, Earl of Glencar. In 1569 he repudiated the Earldom and joined graces with the Catholic Confederacy of Desmond. When the Confederacy broke down in 1571 Dónal submitted and obtained a pardon. In 1580, Gerald, the Earl of Desmond, went into rebellion and was slain in 1583. Another troop of strangers entered Kerry on the Authority of parchment grants which granted them ownership of lands held by the late Earl, on condition that they planted them with good reliable English tenants. Hence they were called undertakers, and amongst them were the Browns (later to become Earls of Kenmare) and the Herberts. In about 1588 the Earl of Glencar mortgaged Castlelough to a Kinsman. Florence was summoned to London and for a period lodged in the Tower. Lady Ellen was detained in Cork, and Florence entered into a bond that she would remain there.However, on a night in February 1580, she and a maid stole through one of the gates of Cork, just before closing time, and vanished into the country beyond. Sir Warham St. Ledger, the Queens President of Munster, urged that Florence’s bond be forfeited and that the Queen take over Castlelough. Very little fortification was needed to make it impregnable. It stood in a great Lough, wherein vast quantities of pearls were found. In 1605, Lady Ellen obtained a portion of her father’s lands with reminders to her sons. At the time brother, Dónal McCarthy got a grant of Castlelough. He was a doughty warrior with a passion for securing as trophies the plumed helmet of Elizabeth’s troops. He is known in local tradition as Dan The Feathers. He made such sport of them that the women were employed in his stronghold in the making of beds. He died quietly, but not before the English chivalry had dubbed him “The Robin of Munster”. The Castle must have been transferred at some later date and it is known that Florence, youngest son of Lady Ellen was residing there in 1642. This Florence McCarthy, together with all the other McCarthys, hanged himself in 1642 under the banner of the Confederation of Kilkenny. The ensuing war lasted until 1635 when the last stand was made at Ross Castle, and Cromwellian Troops battered Castlelough. Terms of capitulation were agreed to and the Cromwellian Wars in Ireland finished on the shores of Lough Lein. When Charles 11 of England was restored, the Lands of Pallas, Muckross, Cahernane, and Castlelough were restored to Dame Sarah McCarthy, otherwise McDonnell, and a sister of the Marquis of Antrim. Her son granted Castlelough to his cousin Denis McCarthy. The Castle remained with his family until the reign of George 11 when it was sold to Colonel William Crosbie. The subsequent history of Castlelough is by way of ordinary purchase and sale. A mansion was erected within view of the ruined Castle and was purchased by the Lalor family of Killarney. In 1846, the death is recorded at the residence, Castlelough House, of Mrs. Martin Lalor on her 90th birthday. Her grandson, John Shine Lalor, was a poet and intimate friend of Daniel O’Connell and was arrested during the insurrection of 1848. The mansion must have been subsequently enlarged as The Lake Hotel and in 1852 belonged to a certain Thomas Cotter. The hotel changed ownership from Cotter to Coffey, and then to Morrough, Bernard, and Courtney. In 1897, it was purchased by Mr. Hillard of Killarney, in whose hands it remained until 1940 when it was purchased by Mr. & Mrs. Martin Huggard of Waterville and became one of their famous family hotels. In recent years the hotel has undergone major improvements while retaining its old world style and charm. In 2012 the Huggard family celebrated 100 years of Irish Hospitality serving visitors from the four corners of the World. Hotels previously owned by the Huggard family include Ashford Castle, Ballynahinch Castle, The Lake Hotel, The Royal Hotel, the Caragh Lake hotel, Bayview Hotel in Waterville and the Butler Arms in Waterville. Today the Lake Hotel and the Butler Arms are still run by Huggard family members.